Chicken Broccoli Slaw - Eat. Drink. Love. Happy Valentine’s Day! This recipe is not romantic or decadent, but it is healthy, fresh, and really tasty! 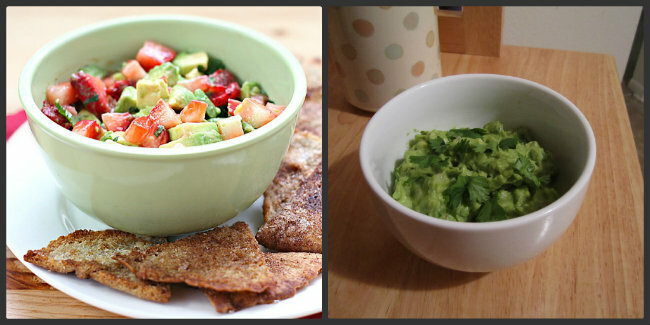 Although I am totally and completely dreading it getting to hotter temperatures here, I am ready for spring foods. Light, crisp, fresh. These are all the things I want right now when it comes to food. I have been getting kind of bored with my salads lately and wanted to change things up a bit. When you think of a slaw, you probably typically think of it as a topping or maybe a side dish, but it can be so much more! Why not eat it as a salad?! 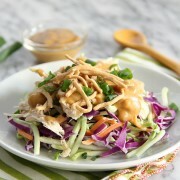 By adding some extra veggies and chicken, this slaw easily stands on its own and is filling enough for lunch. I added some extra crunch with Chow Mein noodles! 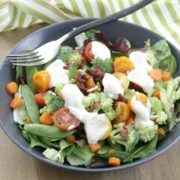 This little salad also has 17 grams of protein so eat it up! 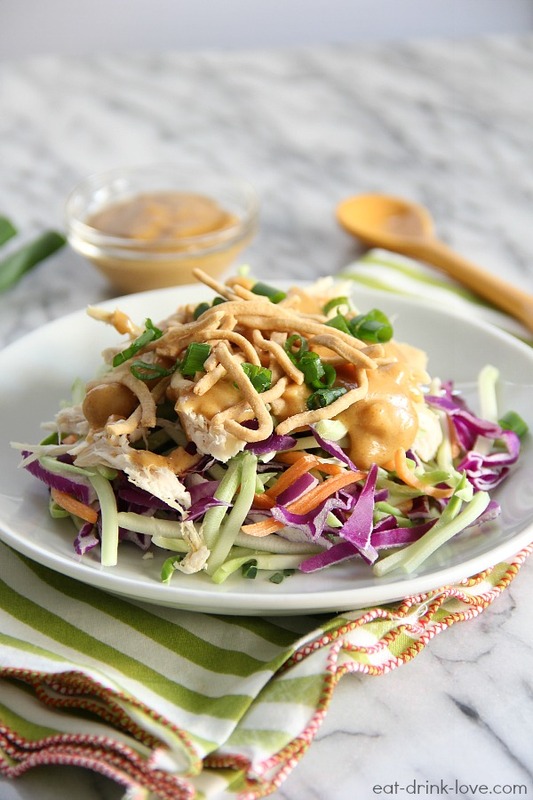 I topped it with some of my spicy peanut dressing which I make quite frequently for a number of dishes including my spicy peanut chicken wrap. I think if I could put this dressing on everything, I would. 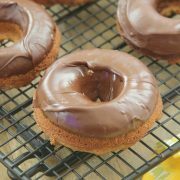 I like to use crunchy peanut butter because it adds texture and well, I’m kind of obsessed with crunchy peanut butter, but you can use plain if you’d prefer. In another bowl, add the slaw, carrots, cabbage, and the chicken. Drizzle desired amount of the peanut dressing on top. Toss. Top with the Chow Mein noodles and green onion. I found a bag of broccoli slaw at Trader Joe’s that already had shredded carrots mixed in, so whatever you can find is fine. You can also find bags with red cabbage already included. 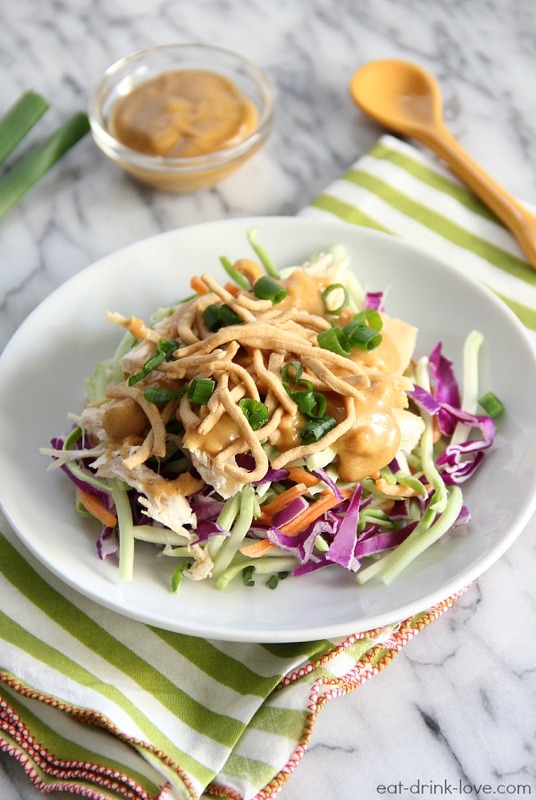 Love that you use slaw as the base of the salad! Great way to mix things up a bit! Um… perfect salad! 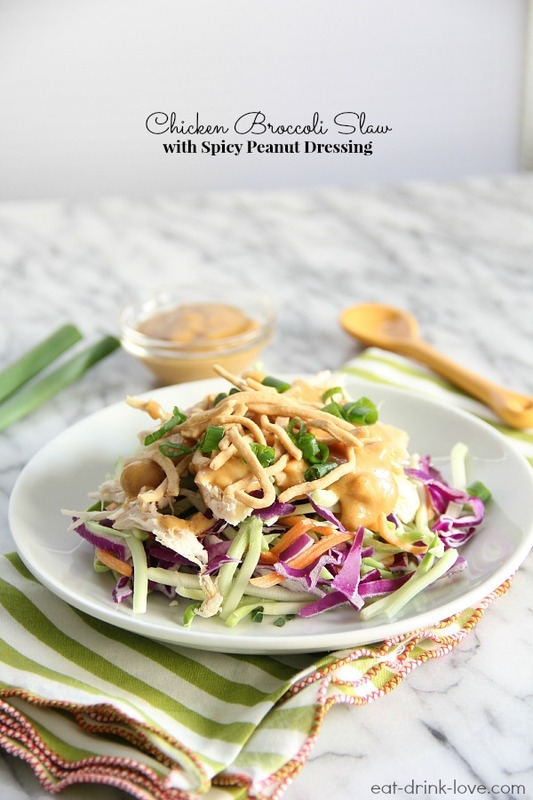 Love that peanut dressing, it may become a new staple in our house and can’t wait to try the wrap that you recommended to. P.S. I can wait for it to warm up around here too, I just told my husband this that this weekend I am going to clean up the grill so we can start grilling again. It has been toooooo long! Yes please… this sounds divine and perfect for entertaining or just a lunch for yourself! LOVE this!!! 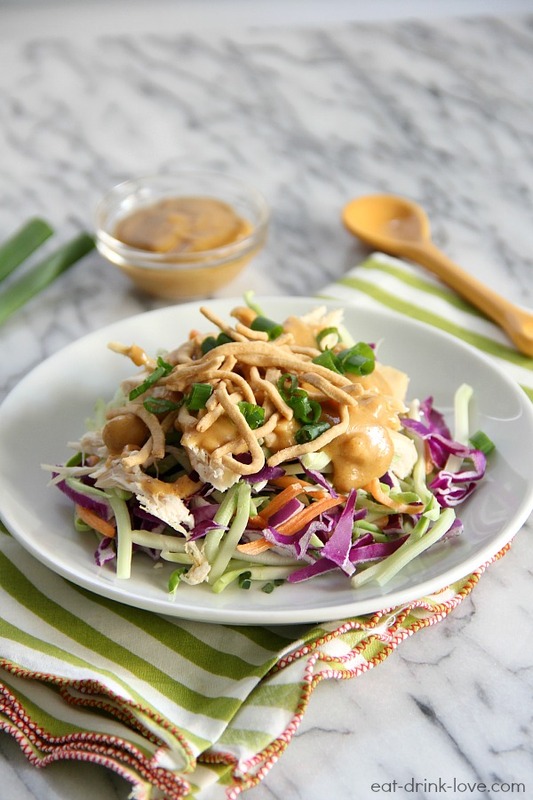 The crunchiness of the slaw sounds so good right now, and PEANUT dressing!! I think I could live off this salad! It sounds spectacular!!!! This sounds delicious! 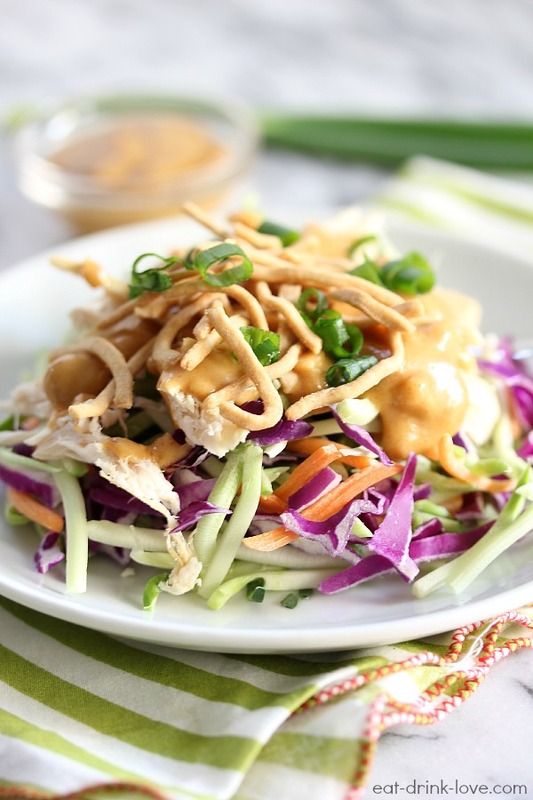 The Chow Mein noodles add a delightful crunch! Made this tonight x 4 for the family. It was great, even my 5 year old loved it, though I didn’t quadruple the siracha. Awesome texture, great taste to the dressing. Loved it!